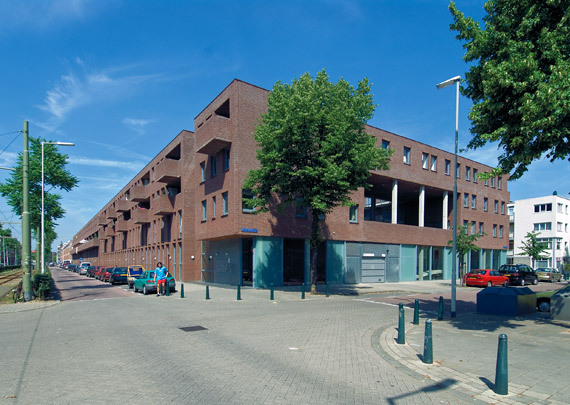 Here, three-quarters of the block between Spanjaardstraat and Watergeusstraat has been replaced by new-build in precast brickwork, sitting atop an underground parking facility. All units are configured as maisonettes, downstairs units with a garden and upstairs with a terrace. They include units that locals can buy or rent. Glass entrances and lift and stair wells contrast with the sturdy brick architecture. The complex does a better job of meshing with the existing fabric than the neighbouring urban renewal architecture.